In an attempt to eat healthy, I have started experimenting with Quinoa. A few days ago I found tri-colored Quinoa at the local Trader Joe’s (TJ’s) and instantly thought of cooking with it. 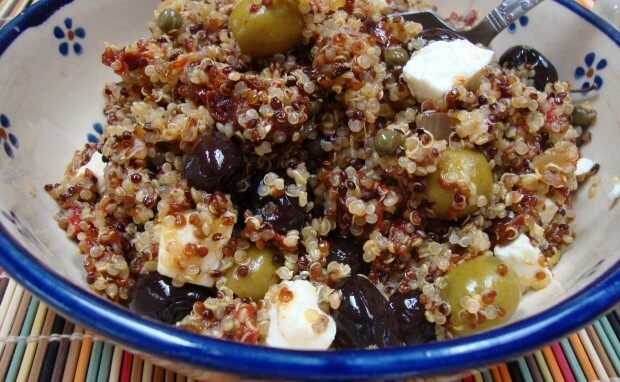 This recipe has a base of Quinoa (which has the ability to absorb other flavors very well and still retains its texture) in combination with all my favorite Mediterranean ingredients. It makes an earthy looking dish that could be used as a side or even by itself makes a hearty satisfying meal. Boil two cups of water in a medium sized pot. 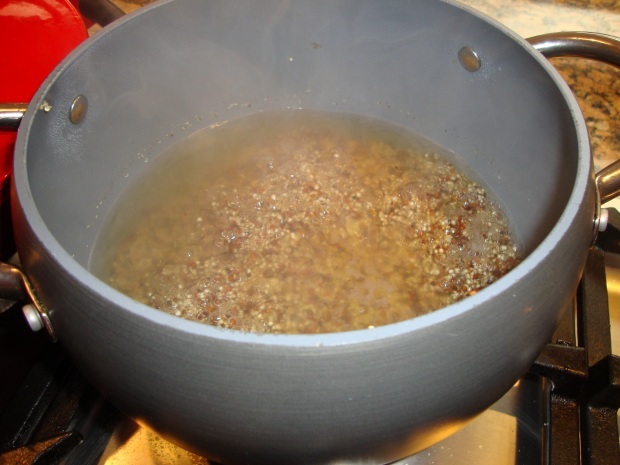 While the water is boiling, wash your Quinoa in cold water. Put the washed Quinoa in the pot with boiling water and the ¼ teaspoon salt) and let it cook over low heat (stir frequently). You don’t need more salt because feta and capers have a lot of salt in them. 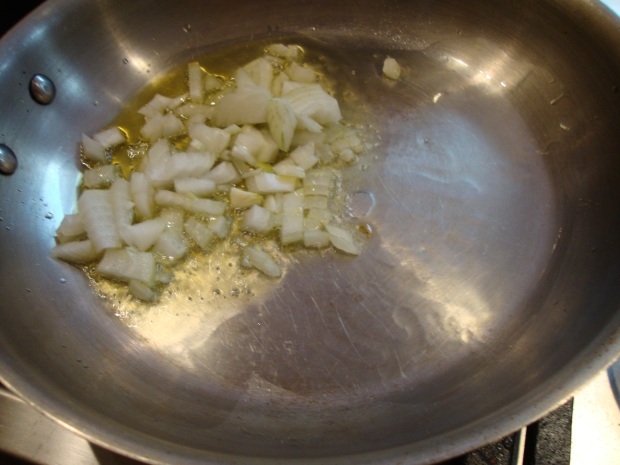 In a separate sauce pan, heat the extra virgin oil over low heat. Peel and chop the onion in small pieces and place in the hot oil. 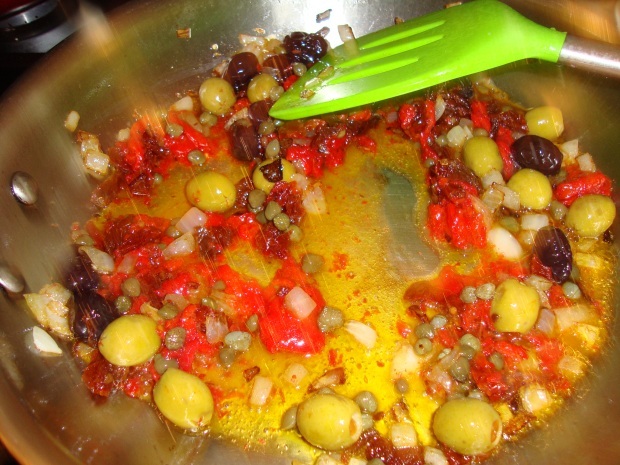 Add the olives, roasted peppers, capers, chili flakes and stir. When the quinoa is cooked (usually takes 10-11 minutes), take it out of the pot and add to the sauce pan with the other ingredients and mix thoroughly. 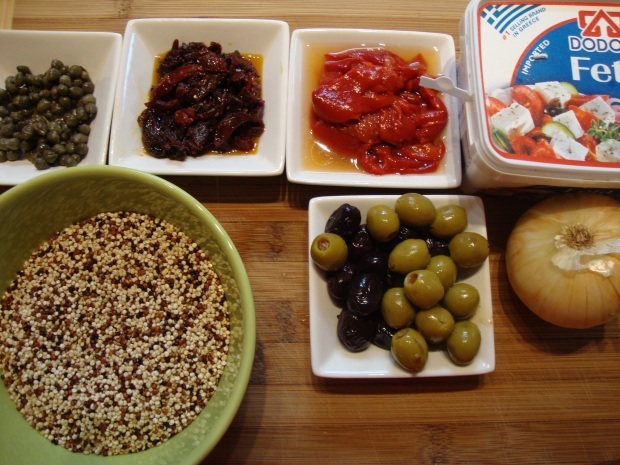 Add crumbled feta to the Quinoa and mix gently. 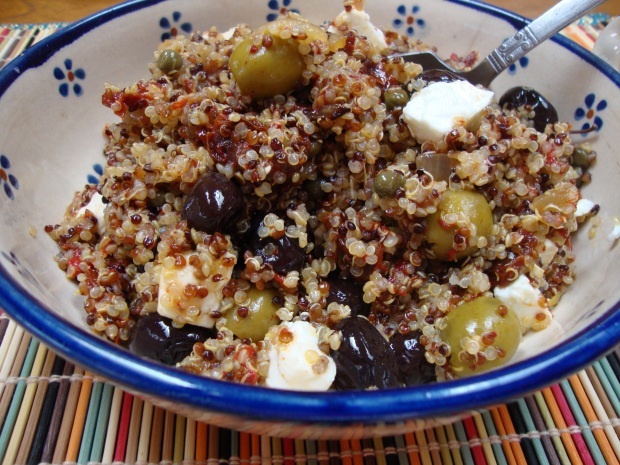 The feta will melt a little bit with the heat of the Quinoa. Let it rest for 5-7 minutes – the Quinoa absorbs the flavors of the other ingredients. Serve hot or at room temperature. It is also ideal for a packed lunch – works well at room-temp and packs in one Tupperware box! 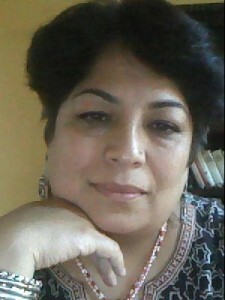 Shabnam, about the quinoa recipe, will the one cup quinoa completely absorb the 2 cups od water when you are done cooking? In other words, do you use the same proportions for cooking rice? Shabnam, superb recipe and great photo composition! Love the colors of the food, dish and placemat.